The lovely folks at CHOW invited me to do a holiday table setting and centerpiece for them a few weeks back, and the photos are now up and posted on the CHOW website. Look for some unconventional table setting ideas from the always inspiring and inventive Cate Kellison of Rose and Radish, as well as the elegant Sally Shim from Shim & Sons, and a bit of retro holiday fun from sfgirlbybay online at CHOW today. I get really bored with fall colors (I think they remind me of those bad, plaid dorm room sofas), so I relish the idea of a bit of diversity when it comes to setting a holiday table with bright and fresh, clean colors. Keeping eye contact is important to Cate from Rose and Radish. And look, there’s tiny deer! Beautiful, minimalist and natural looking craftiness from Shim & Sons. CHOW encourages readers to leave their feedback and comments on the CHOW site – the more feedback they have from people interested in the art of cooking and entertaining, the more stories they’ll be able to do on this fun, holiday subject. 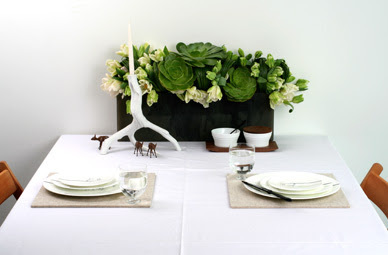 Digging up a centerpiece from stuff around the house (my specialty) from sfgirlbybay. Really lovely – and the pomegranates look great!It’s making me hungry! Your table setting is adorable Victoria. 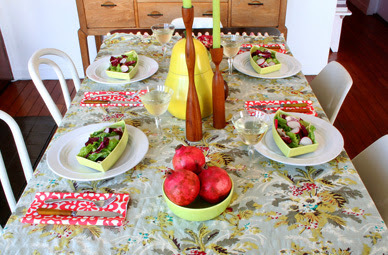 I love that tablecloth- did you make it yourself? 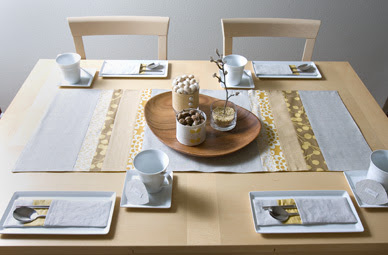 This is a great table setting i absolutely love it, good design. these are great. I love your mix of colors and patterns. And those saled bowls are great! thanks everyone! it was a fun project to work on. i didn’t make the tablecloth – i got it on sale at Anthropologie many moons ago, and the salad dishes are from Thriftown in the Mission – 99¢ each! I have those same bowls (that you used for salad) and I never thought of using them that way! You’re a decorating genius! Very cool Victoria, the table looks great! i loved all of these great ideas! that chartreuse and ruby pink is on of my favorite classic combos. thanks for sharing! these are gorgeous, fabulous work! I love your last table setting – beautiful! !